The Berger des Pyrenees is an ancient breed, a shepherd/flock guard native to, and developed in, the Pyrenees Mountain valleys of France. 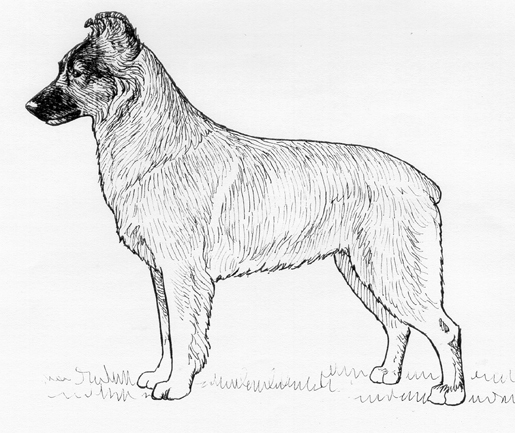 The Berger des Pyrenees was recognized by the United Kennel Club on January 1, 1995. The Berger des Pyrenees is a lean, lively dog of minimal height and weight, with an enormous amount of nervous energy and a mischievous, wary expression. The breed has two varieties: the Smooth-Faced and the Rough-Faced. The Smooth-Faced variety is not as high strung as the Rough-Faced, and tends to be more tractable. It is more outgoing with strangers, and has a very lively, cheerful disposition. Faults: A heavily-boned dog. A square dog. Unsoundness. Heaviness. Thick musculature. This breed is always on the alert, watchful, and ready for action. This temperament, along with his great vivacity of movement, gives this little dog a highly singular gait and appearance, characteristic of no other breed. Faults: Lack of vivacity. Common looking expression. Vicious appearance. The head is triangular in shape. The skull is nearly flat on top; rounded at the sides. There is a barely noticeable median furrow, and the occiput is barely perceptible. The skull slopes gently to the muzzle, without a marked stop. The muzzle is straight and shorter than the skull. Narrow, but not exaggeratedly so, it affects a wedge shape and is well filled in under the eyes. The Smooth-Faced variety has a slightly longer muzzle which is covered with short, fine hairs. The mouth is tight. The lips are not very thick. The upper lip falls only far enough to cover the lower jaw. This often gives the impression that the dog is smiling. The mucous membranes of the lips and palate are black or strongly marked with black. The lips should never sag. A full complement of strong white teeth meet in a scissors bite. An even bite is acceptable, but not preferred. Disqualifications: Overshot, Undershot bite. Wry mouth. The eyes are slightly almond shaped and very expressive. They are dark brown in color, except in the blue merle or slate grey dogs, where wall eyes are acceptable and almost always present. The eye rims are black, regardless of coat color. The eyes are not too prominent, nor too deeply set. Disqualifications: Missing pigment on eye rims. Blue eyes in a dog with a coat color other than grey or merle. Disqualification: Nose color other than black. The ears are rather short and are moderately wide at the base. They are set on top of the head, neither too close to one another nor too wide apart. The ears are traditionally cropped straight across and are thus well carried. Natural ears are acceptable as along as they are set on, and carried, correctly, with the top one-third to one-half falling forward to the front or the side, symmetrically for both ears. The rather long, well-muscled neck springs rather upright out of the shoulders. The rather long shoulders have medium angulation. The tops of the shoulder blades are clearly visible above the line of the back. The forelegs are straight, lean and sinewy. There is a noticeable wrist joint. The pasterns are slightly sloping. The distance from the elbow to the ground is slightly more than half the height at the withers. The body is longer than it is tall. The back is rather long and well-supported. The loin is short and slightly arched. The croup is rather short and sloping. The slightly rounded ribs extend well to the rear. The chest is of medium development and extends only to the elbow. The flank is well tucked up. The Smooth-Faced variety is slightly shorter-bodied than the Rough-Faced variety. Faults: Roach back. Level backline. Strong, with well-defined muscle and good angulation of the pelvis and femur. The lower thigh is longer than the upper thigh and there is good angulation at the stifle. The hock joint is lean, and the rear pasterns are short and either perpendicular to the ground or slightly oblique from back to front. Single or double dewclaws are acceptable, as is the absence of dewclaws. The clean-boned feet are rather flat and oval-shaped. The pads and nails are dark. The small nails are very hard, and are hidden by the hair growing out from between the toes. The Smooth-Faced variety may exhibit a foot that is a little shorter and more cupped than the Rough-Faced variety. Faults: Thick feet. Cat feet. Nails too long. White nails. The tail is usually docked, often flushed with the croup so that no remnant of a tail is left. Natural bob tails vary in length. A naturally long tail is perfectly acceptable as long as it is carried correctly. The heavily fringed tail is set on rather low. A long tail forms a crook at the end. Even when the dog is alert, the tail (short or long) must not rise above the level of the back, but continue along the slope of the croup. Faults: Bad tail carriage. Lack of a crook in a long tail. The hair may be long or semi-long, and almost flat or slightly wavy. The texture is harsh, being halfway between the hair of a goat and the wool of a sheep. The hind legs of dogs with semi-long hair are generally not as heavily furnished as long-haired dogs. The croup and rear legs are more heavily furnished. Cording in this area is entirely acceptable. The hair on the end of the muzzle and the chin must be naturally short. It lengthens as the muzzle widens toward the skull, and is swept back, giving the characteristic windswept appearance necessary for correct expression. The eyes must be readily visible, not covered by hair. The forelegs are fringed with rather long hair. The muzzle is covered with short, fine hairs. The hair on the body is semi-long, or shorter, attaining a length of no more than 3 inches for the ruff, and 2 inches or less along the back. Note: No placement is to be awarded to a dog whose facial hair has been cut, plucked, or otherwise altered in any way from its natural state. The legs are smooth, with minimal fringing. The forelegs are fringed with rather short hairs on the semi-long haired dog. Faults: Too much hair on the head, especially if it hides the eyes. The hair on the moustache and beard taking on any similarity to that of a griffon. Hair of poor texture. Frizzy or fluffy hair. Acceptable colors include: various shades of fawn, with or without a mixture of black hairs; gray, ranging from charcoal to pearl gray; merles of diverse tones; brindle, black; and black with white markings. A little white is acceptable on the chest, head and feet, but solid-colored dogs are preferred. Faults: White patches appearing other than where is acceptable. White patches that are too big. Black and tan coloration. Disqualifications: Solid white, or any color not mentioned in the standard. The skin is fine. It is often mottled with light and dark patches, depending on the coat color. The height range for males is from 15½ inches to 19 inches. The height range for females is from 15 inches to 18 inches. The height range for males is from 15½ inches to 21 inches. The height range for females is from 15½ inches to 20½ inches. In individuals of excellent type, expression, and movement, an additional one inch can be tolerated, but any individuals out of the one inch tolerance range are to be disqualified. In both varieties, an absolute minimum of weight is required; just enough flesh to cover the bones. The ribs should be readily felt. Faults: Overweight. Fat. Heavily-muscled dogs. The trot is free, flowing and vigorous. The feet are never raised high, giving the impression that the dog skims over the ground. At a slow trot, the head is carried fairly high, but as speed increases the head lowers to the level of the back. Rough faced variety: Males under 14½ inches and over 20 inches; females under 14 inches and over 19 inches. Smooth-faced variety: Males under 14½ inches and over 22 inches; females under 14½ inches and over 21½ inches. Nose color other than black. Missing pigment on eye rims. Blue eyes in a dog with a coat color other than grey or merle. Solid white, or any color not mentioned in the standard. In UKC Conformation Shows, this breed is shown by variety in this order: Rough-Faced, Smooth-Faced.